Tony Zummack, coach of Alberta Provincial Champions Team Smart for the past three seasons, has been chosen as the new Head Coach for British Wheelchair Curling. His was one of two non-UK appointments to the five person elite curling coaching team announced today that is expected to bring Olympic and Paralympic success back to British curling. He replaces Tom Pendreigh who I understand did not interview for the wheelchair curling position. Great Britain/Scotland had 3rd, 7th, and 5th World Championships finishes since their silver in Torino, and posted a 3-6 (tied for worst) record in Vancouver. Zummack, a professional curling and golf teacher, will be giving up his job as curling supervisor at the prestigous and private Glencoe Club in Calgary. 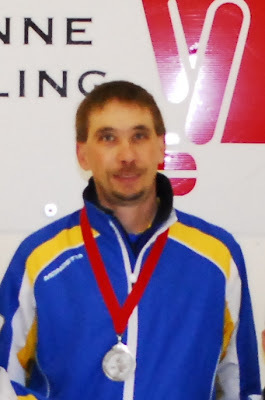 He has worked with the players now skipped by Jack Smart since 2008 curling out of the Ogden CC, coaching them to a silver medal at the 2009 Nationals. Team member Bruno Yizek has since won a gold medal at the Vancouver Paralympics, and Anne Hibberd played for Canada B at the recent Richmond Cashspiel. His task in Scotland will expand beyond the role he played in Alberta, where he was the coach of a club team competing against other club teams. On the technical side it will be interesting to see whether Zummack continues Pendreigh's "deliver from the rings" experiment, and also whether he introduces, as he did in Calgary, the off-side brace, long championed on this blog and website as a tool for increased delivery accuracy. "I am looking forward to the opportunity and challenge," he told me this morning.